We have been experimenting and working with growing winter triticale as a double crop following corn silage for the past 5 years. Work in the region by Quirine Ketterings and Tom Kilcer have shown that it is a good fit for the dairy and if done properly can provide 2 to 4 tons of dry matter per acre of high quality forage in the spring. Those farms that have stuck with it have been successful and have made it part of their rotation. Planting Date. As with any small grain, start with high quality seed. We want good germination and successful emergence. It is recommended to plant 100-125 lbs. per acre. Over the years and many research trials, we have developed a rule of thumb that winter triticale for forage needs to be planted 10-14 days before the normal wheat planting date. So we are looking at the last week in August through the first week of September as optimum. The earlier planting allows for sufficient accumulation of growing degree days to develop as many tillers as possible this fall. We can still plant into early October in our area but realized that yields will probably be down by 30% compared to early September. Plant with a drill at 1.25 inches deep. This will be crucial to get a deep root base established to prevent possible winter kill and heaving. This is even more crucial on later planted fields. I have seen fields that were broadcasted on and worked in. These fields had uneven emergence, were patchy and just didn't produce as well. Remember, you are planting a high quality forage crop not a rye cover crop! Fertility. Most of the needed N-P-K will come from manure worked in following corn silage harvest. It is still best to soil sample to see if additional P and K are needed. If no manure prior to planting, nitrogen will vary depending on planting date. The earliest plantings in August will need 90 lbs. N. This will gradually decrease to 60 lbs. in the first half of September and 30 lbs. after September 20 (Kilcer, personal comm.). An added sulfur source has shown to be beneficial or use ammonium sulfate as your N source. If N can't be worked in (no-till), a protectant should be applied if we remain dry and hot. Again, it is best to soil sample to determine P and K levels. A good "blue book" number would be 40 lbs. each of P205 and K20. Early planting definitely has its advantages as winter triticale serves a dual purpose of keeping the soil covered over fall and winter and providing quality forage in the spring. Getting the plant well established in the fall with maximum tillers will help it get through the winter and off to a quick start in the spring. An additional 50-80 lbs. of N will be needed at green-up. This can be based on how it looks coming out of the winter. If it looks good, push it with more N.
We will talk more about the stages of triticale, harvest timings, and techniques in the spring. 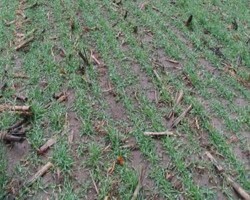 For additional information on winter triticale see the Cornell Nutrient Management SPEAR program Fact Sheet #56, Winter Triticale Forage (http://nmsp.cals.cornell.edu/publications/factsheets/factsheet56.pdf or the August 2015 Crop Soil News from Tom Kilcer on our webpage (http://nydairyadmin.cce.cornell.edu/uploads/doc_269.pdf).